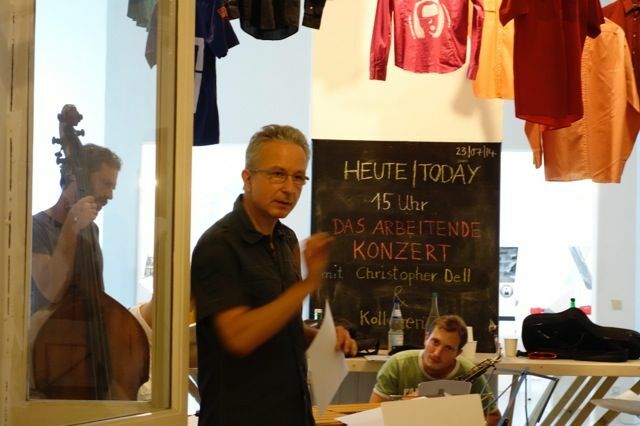 In three days, vibraphonist and architectural theorist Christopher Dell joins with musicians from five European countries to develop The Working Concert: Following public rehearsals as a negotiating process within the ever „working” We-Traders exhibition, the city becomes the stage for improvisation as urban praxis. Drawing on and following-up on the method used for the “We-Traders” exhibition, the project’s title is “The Working Concert.” The title thus refers to the scheme by curator Angelika Fitz, who defines the working exhibition as a chain of events upon and within which the expanded interpretation of an exhibition “collaborate.” Everything that occurs within the framework of the exhibition is a part of it. The work of curating then consists of interconnecting and framing these events. For “The Working Concert” we assume that questions of such improvisational interconnecting can also apply to music. Moreover, the motive of transferring the method to music must be developed historically. Recently many event-based works of visual art from the 1960s have received increased attention under the titles of “notation” or “diagrammatics”. It was mainly interesting to learn that the works made use of the model of music and in particular of the musical score. “The Working Concert” now aims to transpose such process-like practices back to music in the exhibition context. The connection to the We-Traders theme thus makes experimentation with the score and conducting plausible as a form of distributing action. The project is conceived as a series of three events. Under Dell’s direction, “The Working Concert” unites six European musicians whose manner of working is within the context of the concept. The framing of the event series content provides a setting that invites the musicians to become co-producers and co-authors within various parameters. Within these, various tropes of music – rehearsing, practicing, performing, negotiating, repeating, etc. – grapple with the exhibition event – studio, stage, forum, objects, etc. Everything that occurs within the time and place staked out is an installation of the exhibition and/or the concert. At the same time, the chain of events is divided into different spatial modes. For instance, events 1 and 2 take place within Mode 1 (Trading Room) in the exhibition space and event 3 within Mode 2 (City as Stage) as an open air event. Mode 1 emphasizes the studio character, while Mode 2 takes the theatricality of the city itself as a theme and correlates it to the improvisation performance.